SAN DIEGO --- The Commander, Naval Air Forces and the U.S. Marine Corps Deputy Commandant for Aviation jointly announced that the aircraft carrier variant of the Joint Strike Fighter, the F-35C Lightning II, met all requirements and achieved Initial Operational Capability (IOC). The Feb. 28 announcement comes shortly after the Department of the Navy’s first F-35C squadron, Strike Fighter Squadron (VFA) 147, completed aircraft carrier qualifications aboard USS Carl Vinson (CVN 70) and received Safe-For-Flight Operations Certification. In order to declare IOC, the first operational squadron must be properly manned, trained and equipped to conduct assigned missions in support of fleet operations. This includes having 10 Block 3F, F-35C aircraft, requisite spare parts, support equipment, tools, technical publications, training programs and a functional Autonomic Logistic Information System (ALIS). Additionally, the ship that supports the first squadron must possess the proper infrastructure, qualifications and certifications. Lastly, the Joint Program Office, industry, and Naval Aviation must demonstrate that all procedures, processes and policies are in place to sustain operations. 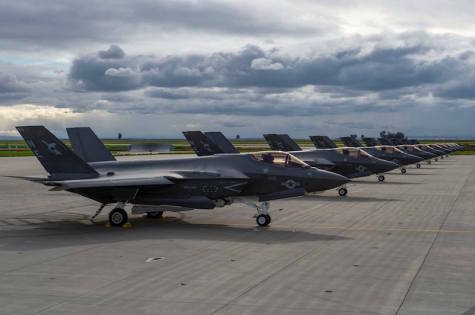 Naval Air Station (NAS) Lemoore is the home-base for the Navy’s Joint Strike Fighter Wing, Navy F-35C fleet squadrons and the Fleet Replacement Squadron (FRS), VFA-125 that trains Navy and Marine Corps CVN-based Joint Strike Fighter pilots. To accommodate the F-35C program at NAS Lemoore, several facilities were built or remodeled to facilitate specific F-35C requirements with regard to maintenance and training, including a Pilot Fit Facility, Centralized Engine Repair Facility, Pilot Training Center and a newly-remodeled hangar. Future projects are planned as additional Navy squadrons transition into the F-35C. The Marine Corps plans to transition four F-35C squadrons that will be assigned to Carrier Air Wings for deployments. The mission-ready F-35C is the latest addition to U.S. Navy’s Carrier Air Wing. With its stealth technology, state-of-the-art avionics, advanced sensors, weapons capacity and range, the aircraft carrier-based F-35C provides unprecedented air superiority, interdiction, suppression of enemy air defenses and close-air-support as well as advanced command and control functions through fused sensors. These state-of-the art capabilities provide pilots and combatant commanders unrivaled battlespace awareness and lethality. The F-35C is the final U.S. Joint Strike Fighter variant to declare IOC and follows the USAF’s F-35A and USMC’s F-35B. IOC declaration is a significant milestone. (EDITOR’S NOTE: By declaring the F-35C Initial Operating Capability (IOC) on Feb. 28, and before the end of the ongoing Initial Operational Test & Evaluation (IOT&E), the US Navy has contradicted previous Congressional testimony without explanation and for no obvious reason. At the time, the F-35 Joint Program Office estimated that the IOT&E would begin in March 2018 and would be completed in April 2019 – 13 months later. In the event, and after several delays, the IOT&E only began on Dec. 5, 2018, and has been cut to ten months; it is consequently due to end in September 2019, and as Adm. Miller said in 2017, the US Navy was supposed to declare IOC only after this milestone. No reason has been provided to explain why IOC has been brought forward by 7 months. However, it appears it was just a publicity stunt, as the first operational deployment on a carrier is not planned before 2021, so there was no valid operational reason except misplaced prestige to explain the change. In fact, the US Navy waited just three months after the F-35C received its “Safe-For-Flight Operations” (SFFOC) certification on Dec. 12, 2018 to declare IOC, which again appears premature. -- March 07, 2019: added US Navy letter below with our reply. Your commentary on the F-35C IOC declaration by the Navy was egregious and incorrect. In your commentary, the writer declared the declaration nothing more than a “publicity stunt,” referencing Congressional testimony in February 2017 by then-N98 RADM DeWolfe H. Miller, who said that IOC was event-driven and impacted by the IOT&E schedule. Your writer said that “no reason has been provided” to explain how IOC could be declared before completion of IOT&E. If you had followed subsequent Congressional testimony, more than 1 year later, RADM Miller’s successor at N98, RADM Scott Conn, testified before Congress in March 2018. Full 3F Capability has been achieved. Your story mentioned Congressional testimony from more than two years ago, but not the more recent clarification. Either you were not aware of this testimony, or knowingly left it out. I request that you update your story to reflect the more current Congressional testimony. While I understand the concerns you express, the fact is the Navy moved the IOC goalposts. The Navy insisted for years that IOC was “event-driven and impacted by the IOT&E schedule,” and that it would declare IOC once the full capability of the Block 3F software was demonstrated during IOT&E. On Feb. 28, however, the Navy suddenly decided Block 3F has been demonstrated less than 3 months into IOT&E, and declared IOC. How and when this happened is not explained, as I pointed out in my Editor's Note. You repeat this claim in your e-mail, but again without any details. It is worth noting, however, that the Navy declared IOC on Feb 28 -- which just happens to be the last day of the time window that was identified for F-35C IOC six years earlier, in the June 2013 "Report to Congressional Defense Committees on F-35 Initial Operational Capability." This cannot be a coincidence, but only a deliberate P.R.-driven action to declare IOC within the time-frame provided to Congress. It is clearly not tied to IOT&E, which won’t be completed until September, nor to an operational deployement, which won't happen until 2021. That is why I called the F-35C IOC a publicity stunt, and nothing in your e-mail has changed my mind. Consequently, we will not "update" our story, as you requested, but we will post your letter, along with this reply, on our website, so our readers are able to judge for themselves.. Thank you for your interest in Defense-Aerospace.com, and for taking the time to express your opinion. Additional note: We also asked the Naval Aviation Command to explain who decided that the Block 3F software "had demonstrated its full capabilities," and when, and why IOC was declared before the end of IOT&E, despite the fact that the first operational deployment is not due before 2021. We will publish their response if, and when, we receive it.